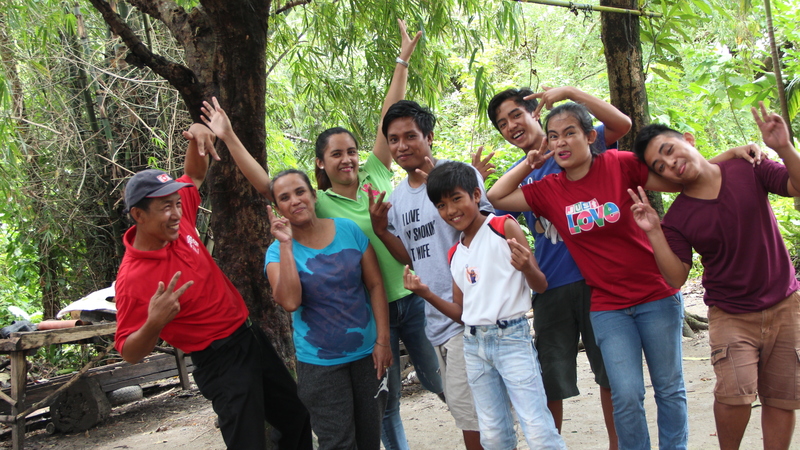 The Manuel family from Sitio Cuartero, Brgy. Casague, Sta. Cruz, Occidental Mindoro, knows no boundaries in serving those who are in need. Helping the Mangyan tribe has been their mission for years, which strengthens the relationship of their family more. They cross rivers and trek hilly terrains to extend their helping hand to the Mangyan communities in their neighboring sitios to educate them and inspire them to become better members of the community. Yet, the Manuel family, themselves, do not live in prosperity. Their family also belongs to the marginalized sector of the community working hard to get out of poverty. But their status in life does not hinder their goal to help those people in need. “Alam po kasi namin yung pakiramdam ng naghihirap kaya tumutulong rin kami lalo na sa mga kababayan nating maliliit (katutubo) na mas nangangailangan pa (We know how it is being poor that’s why we tend to help those (indigenous) people who need greater help),” said Rolando Manuel, “pillar” of the home of the Manuel Family. According to the family, one does not need to be wealthy to help other people. “Kung nagtatanim ka ng mabuting bagay sa kapwa mo lalo na sa mga mahihirap, may malaking bahagi rin yan na babalik. Hindi man natin siya makita nang agaran, sabi nga’y ‘ang mabuting binhi na itatanim mo sa kapwa mo ay sisibol din’ (If you do well to others especially those who are poor, good things will also return to you. We may not see it immediately, but as they say, ‘you will reap what you sow’),” Rolando added. True enough, while they are working towards uplifting their lives, the family makes sure that no one is left behind by providing assistance to other people in their community who are also in need of their help. The Manuel Family is mostly known for their assistance to the Indigenous Peoples (IPs) in their community, specifically the Mangyans. They make sure to extend help to those who are in need even though they, themselves, are also striving to improve their well-being. “Ang buhay namin ay pangkaraniwan lang din kagaya ng iba (Our life is also ordinary like others),” said Rolando. Their family only depends on farming as their main source of income. Rolando inherited a 1-hectare farm land which he utilizes for two croppings every year—palay for the main crop, and corn for the second crop. However, in the year 2000, the land was devastated by a typhoon which caused the river to flood their area leaving them with only half of their land. At present, the family acquires only P2,000.00 to P5,000.00 of income from the remaining land every harvest. After the tragedy, Rosalie knew that it will be harder for them to finance the needs of their growing children. Hence, in order to help Rolando, she raised hogs which gives them at least P6,000.00 to P8,000.00 depending on the piglets to be sold. Meanwhile, to lessen the expenses of the family, Rosalie, with her children, created a backyard garden to plant vegetables for their personal consumption. They also raise native chicken which they sometimes sell or cook for their family. Having six (6) children to support, Rolando and Rosalie make sacrifices in order for them to finance their needs. And as their children see their efforts and hardships, they work together to help their parents in overcoming the challengesthat they face as a family. According to Jacqueline, the eldest child, even though they are poor, they study hard with the aim of helping their family get out of poverty. “Bilang ako pa ang panganay, minsan hindi na ako nanghihingi ng allowance kina mama dahil alam kong wala namang ibibigay. Kaya ang ginagawa ko, pinaglalaba ko na lang mga kaklase ko para bigyan ako ng pagkain (Since I am the eldest, there were times when I don’t ask for allowance from my mother since I know that they don’t have anything to give. That’s why I do my classmate’s laundry in exchange for food),” Jacqueline narrated with teary eyes. After years of hard work, Jacqueline acquired her Diploma in Midwifery and is now working as a Registered Midwife at the Municipal Health Office of Sta. Cruz, Occidental Mindoro. Although she is now married and has a three-year old child, she still participates in her family’s activities in church and in helping the IPs. Meanwhile, James, the 2nd child, said that even though life was really hard, their family stays happy and contented. “Noong nagkasabay kaming mag-college nung kapatid ko, sumasama ako sa mga nagtitinda ng rambutan para magbenta rin para magkapera kaming magkapatid pero okay lang yun kasi naiintindihan naman namin ang sitwasyon namin’ (When my sibling and I went to college at the same time, I sell rambutan so we can have money. But that’s okay, because we understand our situation),” he recounted. James knows that their family cannot support both him and Dorothy, the 3rd child, in college, so he decided to quit studying Maritime Engineering to help their father cultivate their farm. After a year of helping in financing the needs of the family, his parents decided to enroll him again to a vocational course but he was not able to finish because his girlfriend got pregnant, opting him to raise his own family. “Nung una, masakit sa amin kasi gusto talaga sana namin na makapagtapos silang lahat. Pinakasal namin agad sila dahil ayaw namin na sa parte ng babae, baka iba ang isipin ng tao sa kaniya bilang nabuntis siya nang hindi pa nakakasal. Tinanggap na rin namin at wala naman kaming sawang magpayo sa kaniya, (At first, we had a hard time accepting it because we want all our children to finish their studies. We decided to get them married because we would not want other people to criticize the girl since she got pregnantbefore marriage. We accepted them and we never get tired of giving them advise),” said Rolando when asked how they felt after knowing that their son got his girlfriend pregnant. After getting married, James and his new family live with in his parents’ house. He is now working with a Job Order position in the Department of Public Works and Highways (DPWH) in Occidental Mindoro to support his own family. “Nagpapasalamat pa rin po talaga ako lalo na sa aking mga magulang dahil kahit nagkaroon na ako ng asawa ay tinutulungan nila pa rin ako. Pinalaki talaga nila kami nang may mabuting asal at may takot sa Diyos (I thank my parents because even though I have a family of my own now, they still help me. Our parents really raised us to have good moral character and fear of God),” James said. “Nakatapos po ako ng pag-aaral nang dahil sa pagsisikap nila mama. Sobrang naiintindihan po naming lahat yung kanilang sakripisyo para sa amin kaya sa totoo lang po kaming magkakapatid ay tumutulong din para kahit papaano ay makabawas sa hirap na dinadanas ng aming mga magulang (I finished my studies through the hard work of our parents. We fully understood their sacrifices for us that’s why my siblings and I are also helping them so that we can lessen our parents’ burden),” said Dorothy. She was able to graduate with a bachelor’s degree in Civil Engineering through scholarships with her good grades and is now working as an engineer in DPWH-Occidental Mindoro. She plans to take the licensure exam and is now starting to save money so she can attend a review center in Manila. Since Jacqueline, James, and Dorothy are now working, they do not forget to help their family especially their three other siblings who are still studying:John Robert, the 4th child, in Grade 10; Neil Joseph, the 5th child, in Grade 7; and their youngest, Mark Jay, in Grade 5. In fact, the three of them contributed in providing electricity to their house and to their grandparent’s house, which is near them. “Isa po talaga sa pangarap namin ay yung magkaroon ng kuryente kasi bata pa lang po kami, nagtitiis po talaga kami sa gasera lamang para magkaroon ng ilaw sa bahay, (One of our dreams is to have electricity at home because when we were just kids, we only use lamp to light our house)” Dorothy said. Rolando and Rosalie’s guidance to their children has led them to become more compassionate, open-minded, and understanding individuals. They teach their children through action. After their 6PM daily prayer, they talk to each other openly because Rolando sees to it that they should always have time to communicate with his family. “Yang mag-asawa talaga ay marunong dumisiplina sa kanilang anak. Sila mismo ay maunawain at matalungin kaya siguro ay nakikita ng kanilang mga anak iyon (The couple knows how to discipline their children well. They, themselves, are understanding and helpful that’s why their children replicate them),” said Evangeline P. Echon, their cluster’s Parent Leader. True enough, the couple’s kindness had brought Mark Jay to their family. Mark Jay is not a biological child of Rosalie and Rolando. According to Rosalie, Mark Jay is her brother’s child. His wife suffered from post-partum psychosis, hence, they cannot take care the young boy’s needs. Because of this, Rosalie and Rolando decided to foster Mark Jay even though they are financially struggling that time. Rolando said that they did not hesitate to offer their help to support him because he deserves to be loved and be taken care of. “Naghihintay pa kami ng tamang oras para sabihin kay Mark Jay na siya ay ampon. Pero naunahan kami ng tito niya noong nagalit ito sa kaniya nung Grade 3 pa lang siya (We are waiting for the right time to tell Mark Jay that he is adopted. But we were forestalled by his angry uncle when he was in Grade 3),” narrated Rosalie. Even before, Mark Jay has been wondering why he uses a different last name from his siblings since they are “Manuel” while he is “Morris”. Mark Jay does not hold any grudges to his foster parents even though he was not able to know it in the first place. “Naiintindihan ko naman po kung bakit ‘di nila sinabi agad. Hindi ko nga po malalaman yun dahil inaruga nila ako na parang tunay nila akong anak kaya kahit naman hindi sa akin sabihin ay okay lang. Kulang na kulang pa nga po ang pasasalamat ko sa kanila dahil minahal nila ako at inalagaan na parang tunay na anak (I understand why they didn’t tell me straightaway. I won’t even notice that since they take care of me like I am their true son that’s why I won’t mind if they don’t tell me at all. I can’t thank them enough for loving me and taking care of me like I’m one of their children),” explained Mark Jay while crying. At that circumstance, his parents and his siblings have given extra time to guide Mark Jay on his way to acceptance. According to Rosalie, it won’t happen in a day so that they give more efforts to help him because they love him as much as their own child. “Hindi naman naging iba noon pa lang ang turing namin kay Mark Jay. Noong bata ako, sabi ko kay nanay noon wag na lang ako mag-gatas para makabili ng panggatas sa kaniya. Tanggap naman kasi namin siya noon pa (We do not consider Mark Jay as other people. When I was a child, I told my mother that I will stop drinking milk so that we could buy more milk for him. We already accepted him even before),” said Neil Joseph. “Makikita mo naman sa bata kung paano sila pinalaki ng kanilang mga magulang lalo na sa upbringing nito. Kahit si Mark Jay ay hindi nila tunay na anak, ang ugali nya ay kapareho rin ng kaniyang mga kapatid na talaga namang mababait (You can see how well a child was raised with the guidance of their parents through his/her upbringing. Even though Mark Jay is not their biological child, his character is the same with his siblings which are indeed generous),” said Cathy Sofelo, their class adviser in Casague Elementary School, where all six children of Rolando went. It may seem that even though the Manuel family also have their own hardships and adversities, it does not hinder them in sharing their blessings to other people. In 2013, the family was able to become a member of the Pantawid Pamilyang Pilipino Program of the Department of Social Welfare and Development (DSWD). “Sobrang blessed po kami lalo na po noong napasama kami sa 4Ps. Malaking tulong po ito sa amin lalo na po sa mga kapatid kong nag-aaral (We are really blessed when webecame 4Ps beneficiary . It is a great help for our family especially to my siblings who are studying),” said Dorothy. Apart from the financial assistance they receive, the family has become more committed to improve their lives as strengthened from the lessons they have learned from the monthly attendance of Rosalie to the Family Development Sessions (FDS). They become more concerned with their surroundings and the environment that they created their own backyard garden and practiced proper sanitation by having sanitary toilet and managing their wastes through decomposing and recycling. 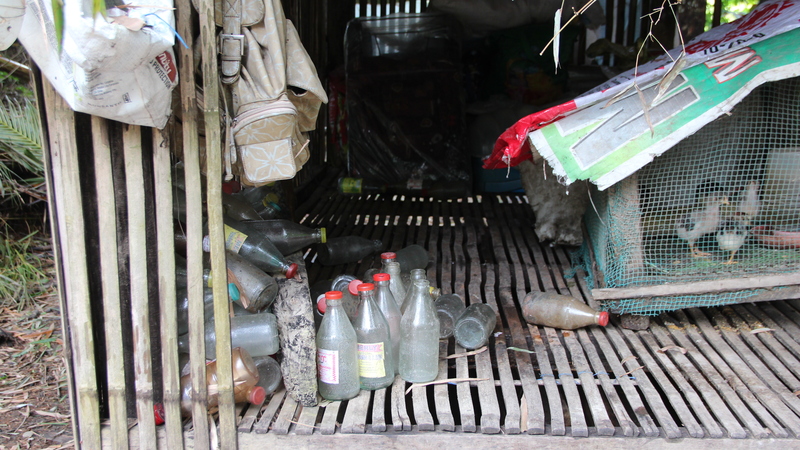 They collect and sell non-biodegradable wastes such as tin cans, plastic bottles, and plastics so they can have additional money for buying their basic needs. Applying their knowledge from the FDS, the family prepares their “Emergency Balde (e-balde)” for disaster risk reduction and response preparation. “Dahil po sa 4Ps, lagi na po kaming may baon sa school at nakakaipon po ako at nilalagay ko sa alkansya. Yung naiipon ko po ay ibinibigay ko kay Mama para pangtulong din po sa gastusin sa bahay (Because of 4Ps, we were able to have allowance for school which I was able to save and put in my piggy bank. I give my savings to Mama to help them with our daily expenses at home),” said Mark Jay, who is one of the monitored children. According to Rosalie, the rice subsidy is also a big help to the family especially since common goods are expensive nowadays. “Ang tulong na binibigay ng gobyerno ay pinapahalagahan namin kaya naman kami rin sa aming pamilya ay tumutulong din sa iba pa nating mga kababayan para kahit papaano ay mag-share ng aming biyayang natatanggap sa kanila, (We appreciate that our government helps us that’s why we also help other people in order to share the blessing we receive to them),” said Rolando. And while the Manuel family receives more blessings with the help of the program, it allows them to share more blessings to other people as well. According to Rolando, his roots have been living in Sitio Cuartero since he was born. His father owns a land where he let the Mangyans work in exchange for a sack of rice. When he was a child, he got to play with the children of the Mangyans who work in their farm. This is when their family started to create a strong bond with the Mangyans in their community. “Mga kalaro ko lang sila dati at minsan itinuturing na rin namin silang kapamilya. Hindi kami yung ibang mga Tagalog na parang iwas sa kanila, (They were my playmates and sometimes, we consider them as our own family. We are unlike other Tagalogs who avoid them),” said Rolando. Growing up with the Mangyans helps Rolando realize that these people are not to be avoided . Since the tribe depends mainly on agriculture and live mostly in the mountains, Rolando knows that it is harder for them to keep pace with development especially that they lack knowledge since education is inaccessible to them. When Rolando, created a family of his own, he made sure that they understand his passion to serve other people. The family has established strong relationship to IPs since they conduct activities such as distribution of school supplies and food packs, etc. “Nakuha na namin sa aming mga magulang ang magmahal sa mga maliliit (katutubo) kaya hanggang sa ngayon, parang ang tingin namin sa kanila ay kaparehas din namin, (We inherited from our parents the love for the indigenous peoples that’s why, until now we see them as equals),” said Dorothy. In school, his children are also kind to the IPs and they also join him in his advocacies to help the Mangyans. “Natutuwa nga po ako sa mga batang yan kasi hindi sila ilang sa mga katutubo. Lagi sila yung kasama nila tapos kapag may nangbu-bully eh sila ang nagtatanggol (I’m glad that those children are comfortable with the indigenous peoples. They are always with them and when they are bullied, they protect them),” said Cathy Sofelo, their class adviser in Grade 6 in Casague Elementary School, where all six children of Rolando went. As a pastor of All Mission Vision Church, a protestant sect founded by the Koreans, Rolando was able to widen his reach to the minorities through linking them to God and at the same time helping them improve their lives. As a church leader, he was able to contribute in the establishment of churches in their barangay. In order to serve his community more, he serves as barangay official for 23 years. Meanwhile, Rosalie volunteered as a barangay health worker (BHW) for 28 years. With his desire to help the Mangyans in their community, Rolando was able to help in the establishment of a minority school in Sitio Ke-Oring presently known as Ke-Oring Minority School. When he found out that a Korean retiree is planning to have a school building project in Sitio Pinagturilan and was not approved by the IPs in the area, he proposed for its transfer to Sitio Ke-Oring. He lobbied the proposal of the project to the barangay local government unit so they can support him. Rolando believes that education is a significant step towards empowering the IPs to improve their well-being. “Noong una, day care pa lang ang school na yun, pero ngayon ay hanggang Grade 4 na (The school started from day care but now they offer classes for Grade 4 already),” Rolando said proudly. Furthermore, the family seeks help from Ministries without Borders, a non-government organization (NGO) in Abra De Ilog, Occidental Mindoro, to sponsor the school supplies of IP children in different IP communities in their area. Together, the family has been doing this activity every May or June for three years now. The school supplies include bag, notebooks, ballpen, pencil, and crayons. Aside from that, the family also conducts feeding program and other recreational activities (i.e. youth day) to the IPs of Barangay Casague. Their children on the other hand, teach IP children to read, write, and sing praises to the Lord. According to Dorothy, the IPs are their inspiration for striving hard amidst the difficulties in life. But the family is not only generous to the IPs but also to other Tagalogs in their community. “Wala akong masasabing masama sa kanilang pamilya dahil wala silang bisyo, mababait, at mapagkakatiwalaan. Bukod sa pinansyal na tulong sa amin, sa kanila din namin nakilala ang Panginoon (I don’t have anything bad to say to this family since they do not have vices, and they are kind and trustworthy. Other than helping us financially, they also lead us to know God),” testified Purificacion Asuncion, their fellow church servant and neighbor in Barangay Casague. The endeavor and perseverance shown by the family is priceless according to their neighbors in Barangay Casague. As an ordinary family who performs extraordinary things for their community, they serve as a model and inspiration to other families. For the family, being a good community member means developing oneself and at the same time helping other people with their development. The greatest prize of their efforts is seeing the smiles of the people they help, especially the minorities. “Minsan tinatanong namin ang sarili namin kung bakit ba namin kailangang gawin ang mga bagay na ito. Bumabalik lang kami sa aming paninindigan na kung kami, bilang mga Tagalog ay nakakaranas na makakain ng kumpleto kahit simpleng ulam, bakit sila ba walang karapatan na magkaroon din? Palagay namin, kailangan naming gumawa (We sometimes ask ourselves on why we do such things. We just go back to our standpoint that if we as Tagalogs can be able to eat a complete meal even with simple food, don’t they also have the right to have what we have? We think that we need to do something),” said Rolando. When asked about their secret of maintaining harmonious relationship of their family, Rosalie said, “walang perpektong pamilya pero kapag nagkakaisa at nagtutulungan, mas nagiging maganda ang kanilang pagsasamahan (there’s no perfect family but if they have unity and all of them work together, their relationship becomes better)”. Through conducting activities for the IPs, their bond becomes stronger than ever. “Natutunan namin mula sa aming mga magulang na kailangan tayo laging makiramdam sa kung ano man ang nararamdaman ng ibang tao. Kaya naman, mas nagbukas din sa isip namin na intindihin ang sitwasyon namin na nakatulong rin naman para makatulong kami sa ibang tao (We learned from our parents that we need to be empathic towards other people. Thus, it opened our minds to understand our situation which helped us in helping other people as well),” Jacqueline added. The Manuel family wants to show that something can be achieved without receiving anything in exchange. Their heart burns with passion to help others as they continue to go out, take action, and accomplish more.